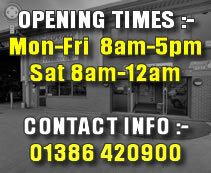 You can contact us by email or telephone or simply book an MOT live on-line now using the form on the right. Thanks for using Spencer Commercial Service Ltd. Please use the form below to send us your enquiry by email, all fields are required. Enterprise Way, Vale Park, Evesham, Worcestershire.